Here’s a perfectly cooling 8-ingredient vegan cold beet soup for hot summer days. 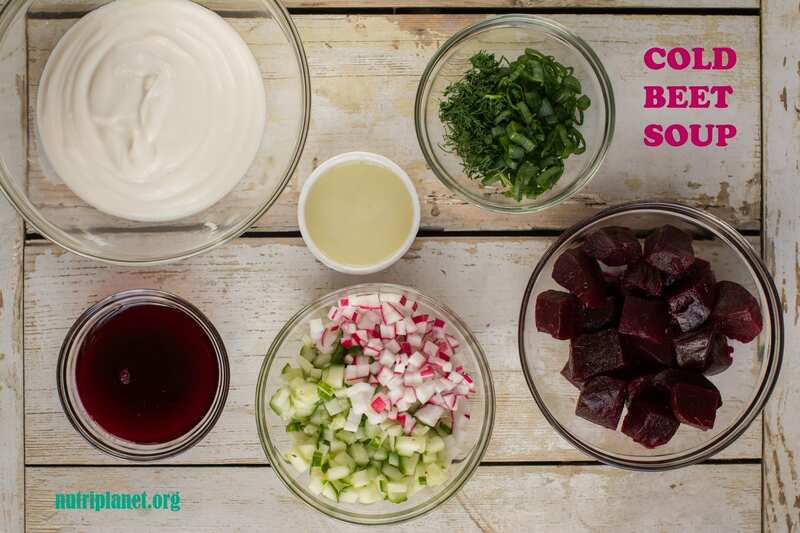 This chilled beet soup really arouses your taste buds and is ready in just 15 minutes. Make sure to watch the tutorial video of my cold beet soup further down! I’m sure you’re like me and don’t want to sweat in the kitchen when it’s already too hot outside. If that’s the case, this is a perfect summer soup that is served cold and doesn’t require any special skills or an awful lot of time. The key ingredients of my cold beet soup are plant yogurt and beetroot for the sweet/sour taste and the beautiful red colour. Whereas, lemon juice, onion greens, radish, cucumbers and dill add extra flavours and freshness to this cold soup. 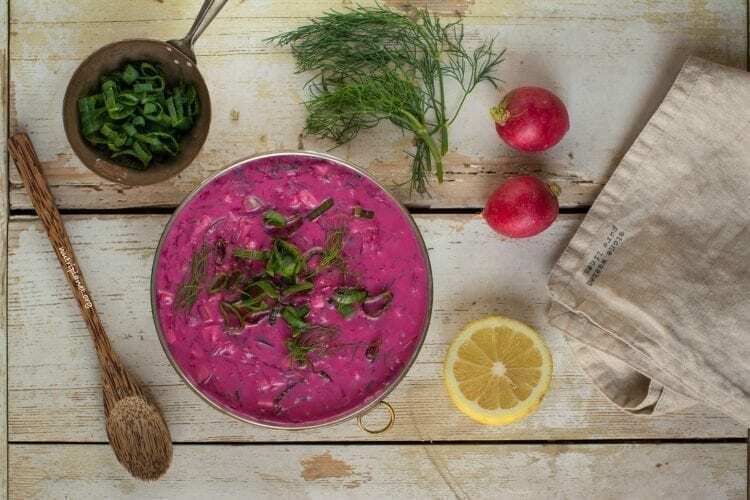 I first had a taste of this perfect summer soup in Riga, Latvia in a vegan restaurant. They used cashew kefir as a base, but as it’s not widely and freely available, I decided to go for plain unsweetened plant yogurt in my recipe. Also, their soup was only slightly pink, whereas my soup is beautifully red letting you know from distance about the presence of beets. I happened to use soy yogurt, but you can try other varieties instead, such as cashew, almond, hemp, oat etc. I must admit, I created my own version of this cold beet soup on the first try. Moreover, I have never written a recipe post before I actually tried the dish out 🙂 Furthermore, I took the chance to shoot the tutorial video while making the recipe for the first time. How crazy is that?! Needless to say, I was so pleased that everything turned out just fine. In fact, I couldn’t wait to finish the photoshoot to be able to eat the bowl 🙂 My hubby said the soup reminded him of his childhood! Finally, if you prefer a heartier meal, serve some boiled potatoes or sweet potatoes as side or add boiled chickpeas, beans or lentils to your summery chill soup. Alternatively you might like a slice of fermented buckwheat bread, quick barley bread or a yeast-free bun to accompany your cold soup. There’s plenty of choice! So, it’s really up to you whether you desire a quick and light snack or a complete meal. 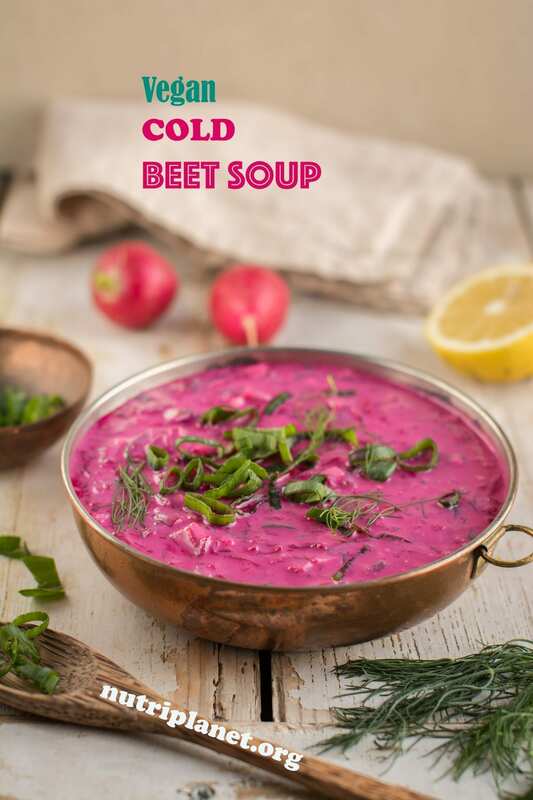 Finally, please do let me know if you make this cold beet soup! Just leave a comment below or tag me in social media. I’d be delighted to hear from you! First, preferably wearing gloves, finely grate beets. Alternatively, buy grated beetroot to save some time. 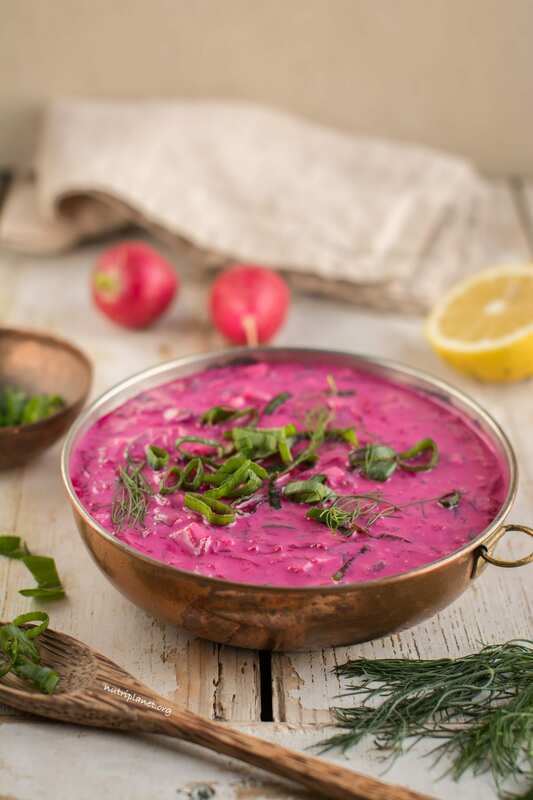 Then, pour yogurt into a bigger bowl and mix in grated beetroot, finely chopped cucumber and radish, and chopped onion greens and dill. Thin the soup with some water if necessary. Finally, season with salt and pepper and add some extra onion greens and fresh dill before serving. Nutritional info per serving: 124 kcal, 8.28g carbohydrates (39.4% of kcal), 5.96g fats (43.4% of kcal), 7.5g protein (24.2% of kcal), 3.48g fibre, and 3 GL points. P.S. 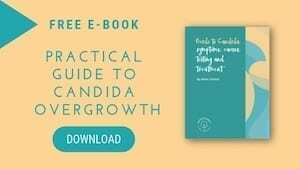 The glycemic load greatly depends on the yogurt you use. Mine was unsweetened soy yogurt containing no sugars or starches. Save time and buy grated beetroot (if available). 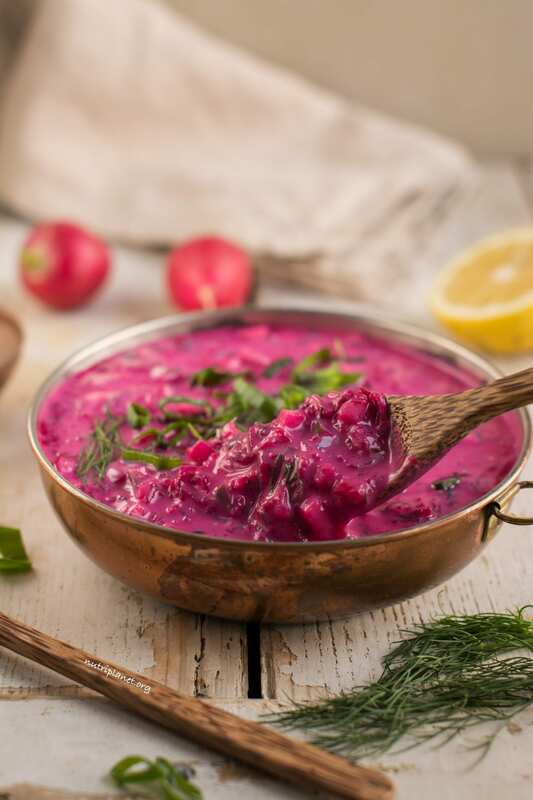 If you don’t have beetroot cooking liquid, blend some of the beetroot with yogurt for nice red colour. Instead of soy yogurt any plain plant yogurt, sour cream or kefir will do, such as cashew or almond yogurt or kefir. Coconut yogurt might have too strong taste and be too heavy when used alone. Instead you might try it in combination with other yogurts. If you want to save some more time, use apple cider vinegar instead of lemon juice. Feel free to use regular Himalayan salt instead of black salt if you’re not after the egg-like taste. You can go an extra mile and prepare the beetroot from scratch – boil whole beetroot until tender or cut into smaller cubes and bake in the oven at 200°C (390°F) for about 20 minutes (until tender). Finally, for a soup lower in fat ditch coconut milk and your soup will have 29.8% of kcal from fat (instead of 43.4%).